The road under Commonwealth Avenue Bridge between West Basin and Commonwealth Park will be closed from Monday, June 19 until Friday, September 8 this year to allow for the construction of a new public park. Diversions will be set up to ensure continuous access to both Commonwealth Park and West Basin parking areas during the temporary closure of Barrine Drive, which will allow work to begin on a waterfront park next to Commonwealth Avenue Bridge at the southern headland of West Basin. The road will be reopened during Floriade before being closed again until the park’s completion in early 2018. It will be reopened as a shared zone at that time. LDA City to the Lake Director Nicholas Holt acknowledged the diversions would present an inconvenience to some visitors to the area during the construction period. 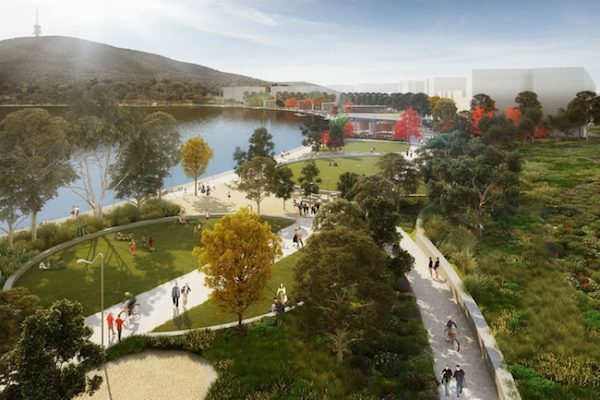 “But the delivery of a waterfront park, along with the new public boardwalk in West Basin, will create a fantastic new public space where Canberrans and visitors to enjoy Lake Burley Griffin,” he said. I wonder whether it’ll have a shorter delay. Otherwise people will push the button and find a gap in traffic before the lights change. They’re right, it will be an inconvenience, but I’m really looking forward to the development of West Basin. As the saying goes, you can’t make an omelette without breaking a few eggs. Should be an underpass . No?